Students cram a Pack the Flavor session. Small-scale university cooking demonstrations at North Carolina State University give students face time with chefs and cooking confidence. 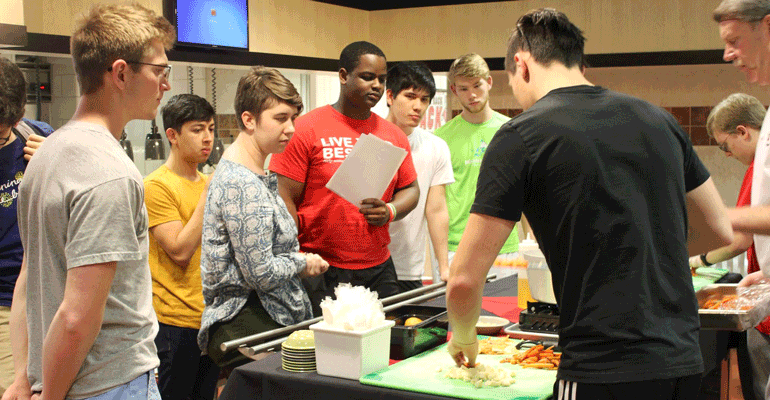 Last fall, North Carolina State University launched its Pack the Flavor cooking demonstrations at locations across campus. Using the most basic tools, like the ones students can find in their dorm kitchens, campus chefs teach students how to create meals from scratch. Each demonstration was open to between 20 and 30 students. Dining limits the number of participants in order to create an intimate, hands-on experience. “If it’s too large it gets diluted,” says executive chef Adam Smith, one of the program’s architects. North Carolina State University says it is the first, and only, university to fully meet the required guidelines of the Healthier Campus Initiative. The initiative, part of the Partnership for a Healthier America, challenges colleges and universities to meet food and fitness goals to make it easier for students to prioritize their health. Once they met that challenge, Eberhart and a core group of university chefs—Smith and executive chefs Brian Corcoran and Sonny Cosper—started envisioning how they could expand their impact on the student body of 30,000. Face-to-face cooking demonstrations fit with their vision because gaining cooking skills increases student options for healthy eating. 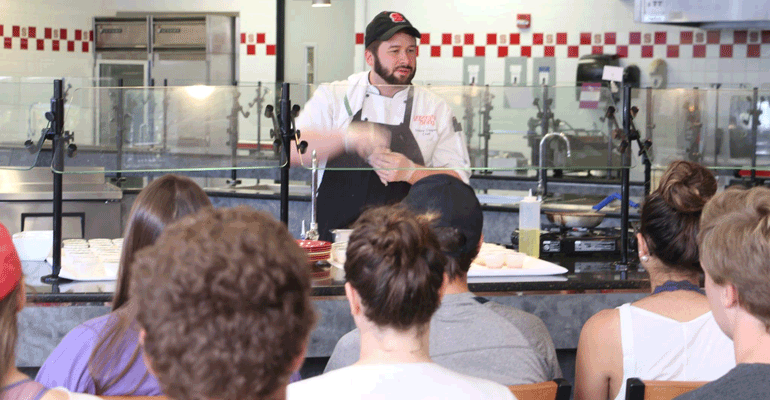 Corcoran says campus chefs use a holistic approach to the cooking demonstrations. They are pragmatic lessons on topics like cooking a whole chicken or making vegetable soup. Subjects such as knife skills or food safety are rolled into the lessons. Chefs may teach students how to grip a chef’s knife while dicing onions for a pico de gallo or demonstrate proper glove use while they’re prepping a chicken. NC State Dining Executive Chef Sonny Cosper at a Pack the Flavor cooking event. Eberhart, who organizes the program, says the demonstrations also highlight the culinary skills of the dining team, which elevates the perception of their dining services program as a whole. The university employs 26 chefs, many of them accomplished industry veterans. Chefs develop the topics, organize the events and lead the demonstrations. Topics are simple, designed to teach essential skills and to burst the persistent misconception that cooking is complex. “We want them to understand that cooking isn’t hard or intimidating,” Cosper says. During the events, students observe chefs preparing and cooking ingredients. Then they take turns chopping, sautéing, blending or mixing ingredients themselves. Sometimes chefs place participants in stations and assign them tasks, such as chopping herbs or slicing tomatoes that end up in a communal dish the group samples together at the end. Since one of the visions for the program is to help students use their new skills right away, participants often leave with a jar of food that’s ready to cook: bouillon and vegetables for soup, a fresh ball of pasta dough, a batch of stir-fry sauce. They also leave with recipes. Students try their hand at putting into practice what they’ve learned at one of the Pack the Flavor sessions. And it seems to be working. The students are enthusiastic learners. Sometimes they’ll approach chefs on campus later to show them photos of the dishes they’ve made on their own. The program is also beneficial for chefs and other foodservice workers. Demonstrations require only a few pieces of basic equipment that the university already owns, such as cutting boards, knives, pans and blenders. They are open to the whole student body and free for participants. Eberhart says the cost for each demonstration is no more than five dollars per participant. Recruiting students has been almost effortless. Within five minutes of a social media announcement inviting students to sign up for a demonstration, the slots are filled. The program will continue this year, with another 20 demonstrations already in the works. Cosper says the chefs are looking forward to watching students as they continue to grow their cooking skills.